Donegal midfielder Neil Gallagher has retired from inter-county duty because of injury, manager Rory Gallagher announced on Monday. Gallagher, 33, has been bothered by a back injury for some time. The Glenswilly clubman had already been ruled out of this year's Football League because of the injury but he has now opted to call time on his career. Gallagher began his Donegal career in 2003 and helped the county land the All-Ireland title in 2012. The midfielder becomes the fifth member of the 2012 squad to have announced their inter-county retirement in recent months. Eamon McGee, Colm McFadden, Rory Kavanagh, Christy Toye and David Walsh have already quit Donegal duty. Rory Gallagher's squad has also been depleted by the decisions of Leo McLoone and Odhran MacNiallais to make themselves unavailable for 2017 while Anthony Thompson is also ruled for the early part of the League because of personal reasons. 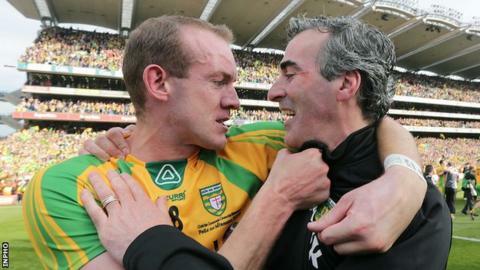 Four years after making his Donegal debut, Gallagher captained the county to the 2007 Football League title and he picked up the first of three Ulster Championship medals in 2011 when Donegal defeated Derry in the provincial final. In recent seasons, Gallagher, who won All-Stars in 2012 and 2014, has been affected by a series of injuries, which included a serious knee problem. He played no part in last year's championship after picking up a back injury in a League game against Roscommon in March. A further shoulder problem affected him later in the summer and while the manager said in early December that the midfielder had been given the "green light" to resume training, he has now had to admit defeat in his battle to regain fitness.